Why Is My Washing Machine Overflowing? Washing machine overflow is absolutely one of those worst-case scenarios you hope will never happen. Water all over the floor may seem like a fun slip-n-slide to your kids, but you already know the problem is going to be very messy... and expensive to fix. We always say that the best offense in home plumbing is a good defense. 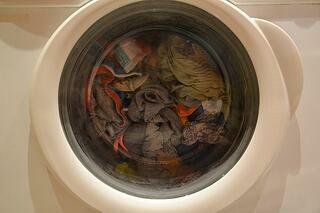 Let's take a look at the causes of washer overload, before you're scrambling to call for help. The main reason your machine is overflowing deals with the drain pipe, and this is especially common in older model homes. Back then, appliances were smaller and didn't require a large pipe to drain the water out. Today, we live on extra-large washers that use more water and need to be drained out faster. The pipe in that older model home that the washer drains into has the tendency tobe overwhelmed by modern water amounts, resulting in an eventually overflow and flooding situation. See those pipes behind the washer? They need to be cleaned out so lint won't build up inside, also causing your drains to overflow. Yes, it's true, not only do you need to clean the lint out of your dryer, but your washer is important, too. What Do I Do When An Overflow Occurs? Switch off the power supply to the washer at the circuit breaker or fuse box. DON'T press the "Cancel" button on the washer's control panel since this can worsen the overflow by activating the drain cycle. Remove any items near or around the flooded area and dry them as quickly as possible. Wipe up the floodwater, and dry the room with fans and dehumidifiers. . Remove the clothes from the washer and wring them out over a sink in the kitchen or laundry room. Check the washer hoses for damage. Pull the washer away from the wall and look for drippings or leaks. If there are damages to hoses, replace them and, if not, make sure that all hoses are secure and in place. Do a test to check that the machine works. Try a regular wash with no laundry. Check the machine’s instruction manual to learn what to do when the cycle stops prematurely. If you still notice performance issues, file a warranty claim (provided that the warranty hasn’t expired) or call a technician to inspect the washing machine. How Do I Prevent A Drain Overflow? Avoid overstuffing the washing machine with laundry and distribute clothes evenly and loosely inside the machine. Check water supply hoses periodically and replace the old ones with newer types, such as ones with a flexible plastic tubing encased in a stainless steel braided exterior. Install a water alarm near your washing machine to notify you of leaks. An automatic shutoff valve can also prevent flooding due to broken hoses, leaky valves or other malfunctions. Use the right detergent in order to avoid suds and bubbles that can cause the washer to overflow. Don’t use more detergent than necessary. Consider front-loading washers as they use less water than most washers. Don't forget here at Ken's, we can check out your washing machine pipes at any time to make sure you fully avoid an overflow. Following these tips is a great start, but if you want to be sure you won't come home to a soggy laundry room floor, it's only best to call us. If you are experiencing any issues, be sure to schedule service with us by clicking the banner below, or calling us at (864) 242-5511.